Editor’s note: The use of smartphones and mobile, handheld computing devices like the iPhone, iPod Touch and others among physicians is remarkable. In 2011, 81% of US physicians own a mobile device1, 54% of physicians access medical information on their smartphone during patient visits2. Currently, the most popular devices are Apple iOS devices (32% iPhone/iPod Touch, 22% Blackberry, 16% Palm, 9% Windows, 4% Android, 2% Symbian1). If you have app suggestions, or if you use an Android device and would like to submit an article, please email us at feedback@thischangedmypractice.com. We hope you enjoy this series of articles. A large part of my practice is focused on the management of diabetes. A key recommendation from the CDA guidelines is the achievement of A1C targets of 7%. Also, when appropriate, I encourage patients to perform self-monitoring of blood glucose levels. I try and teach all my patients what the role of the A1C is as well as how to use their home measurements to guide treatment. More often than not, patients either don’t test at home at all, or if they do, they test only in the fasting state in the morning, which may give falsely reassuring results as they assume the rest of the day looks similar. These kinds of discussions have been useful in encouraging adherence to therapy and improved understanding of disease pathophysiology, however, I often found myself guesstimating values, which obviously introduces a potential for misleading advice. 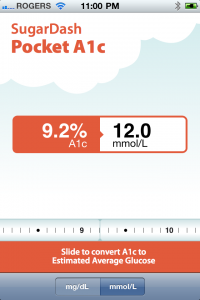 A free app called Pocket A1C makes it extremely easy to illustrate to patients the relationship between their A1C and average glucose readings. They can immediately see that I’m not simply making up a number, but more importantly, the real-time, animated sliderule really seems to impact patients when they see me scrolling up and up to get to an A1C of 9.2 as well as see their average glucose of 12 mmol/L. I now use Pocket A1C several times a day. This direct illustration from a lab value (A1C) to a number they may be intimately familiar with (their own glucometer readings) greatly increased patient acceptance of recommendations for intensification of treatment. 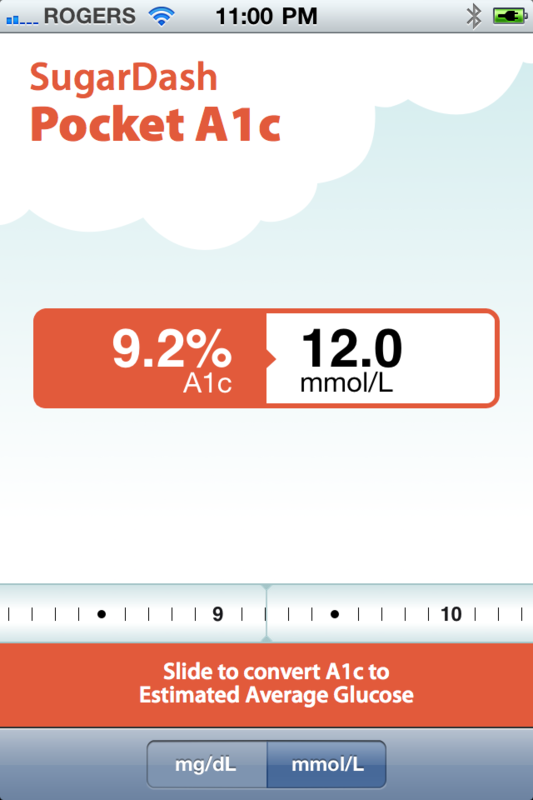 I also found the app saved me time in explaining the utility of the A1C assay. Pocket A1C has helped me achieve targets in patients who may have been reticent to accept more intense treatment and I believe helped me educate my patients more effectively about their diabetes. Such an easy tool for me and for my patients! I believe it will lead to encouraging better compliance with regular testing and consistent dietary moderation! A very useful app. patients are often confused between the A1C and the glucometer readings as the numbers are often identical. This will help to reduce the confusion. HELPED ME ACTUALLY GET A BETTER FEELING FOR HOW OUT OF RANGE MY PATIENT’S BS’S ARE. MOST PATIENTS USE APPS NOW AND THIS IS SO EASY FOR THEM TO RELATE TO. It will provide data for better compliance. Wondering if Readers have suggestions for a good App re: antibiotic therapy and guide. “Mark my words – the day is not far off when physicians will be prescribing patients Smartphone apps and wearable sensor devices just as routinely as they prescribe pharmaceuticals, physical therapy and other treatment options today. These two are my must haves. I use Mediquations for things like the opioid calculator and others. OB patients for tracking my mat pts. HanDbase for my billing, obstetric log (unfortunately OB patients won’t log the pt once delivered) and field notes (amongst other things). Talking Tom and Talking Carl to try and convince recalcitrant toddlers to let me look in their ears. Still trying to decide between PALS CoreChart and PediStat. Problem is don’t get call to use all that often to really test. Dermatomes cause I can never flippin remember them! The Americans frequently use the HbA1C as a screening tool for diabetes which to me seems quite logical. You do not need to be fasting and it quite conveniently can be included along with other lab requests at the same time. However, as everyone knows up here in BC, MSP technically does not cover this test to be used as a screening tool. I do not encourage my T2DM to self monitor their blood sugars. The cost to the taxpayer is substantial in comparison to a 3/12 A1C. I do show them the correlation between mmol readings and the A1C percentage if they do have BSM. good argument to get a smartphone!